Lock in a great price for Hotel Fioreze Quero Quero – rated 9.3 by recent guests! The amazing kindness of their staff! The reception they gave us! Bruno was a great host! The staff was extremely welcoming. My 13 year old stepson felt like we were in a 5-star hotel because everyone was so polite. I loved the chalet style room-- 2 rooms in each "mini house" with a parking spot and our own park bench right in front. The pool was very warm. Equipe super gentil. Eles interagem com o hóspede. Café da manhã muito bom. Localização de acordo com o esperado. Roupa de cama boa. Muy lindo y cómodo hotel, con excelente desayuno. Se destaca la excelente disposición y amabilidad de todo su staff. Realmente recomendable!! Da limpeza dos quartos do cheirinho bom dos lençóis e toalhas. Gostei muito da hospitalidade, funcionários super simpáticos e atenciosos, estão todos de parabéns!! Café da manhã maravilhoso!! Quarto Limpo! La verdad que no sabría por donde empezar, la calidez del personal, el servicio, las instalaciones, todo excelente. El desayuno insuperable, todo casero (tortas saladas y dulces, panes, bocaditos calientes, etc. ), jugos, fiambres, quesos todo fresco. A modo de ejemplo mi hija tuvo un percance medico y ellos se preocuparon de buscarnos el especialista al que poder asistir y todo se soluciono rápidamente. Un hotel altamente recomendable. 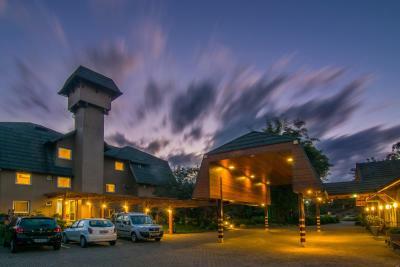 Hotel Fioreze Quero Quero This rating is a reflection of how the property compares to the industry standard when it comes to price, facilities and services available. It's based on a self-evaluation by the property. Use this rating to help choose your stay! 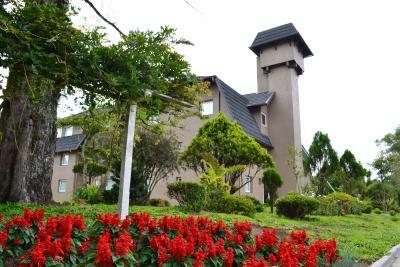 One of our top picks in Gramado.Quero Quero is set in a beautiful park with rich vegetation and colorful flowers, 1.2 mi from Gramado´s city center. 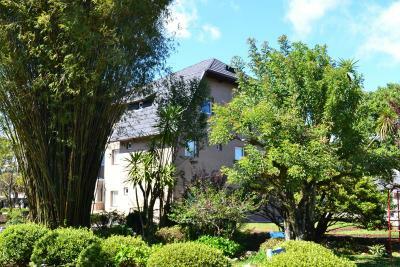 It offers free WiFi and alpine-style chalets with fireplace. 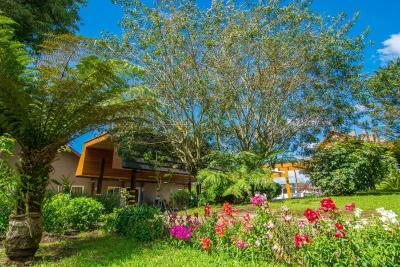 The hotel features rooms and chalets with a 32" LCD TV, mini-bar, air conditioning, heating, box-spring beds and thermal blankets. Room service and a 24-hour reception are available. Guests enjoy a varied buffet breakfast with homemade German and Italian specialties. It includes several varieties of breads, pastries, cakes and jams. For dining, guests can get discounts at local restaurants, as well as free transportation to them and back to the hotel. 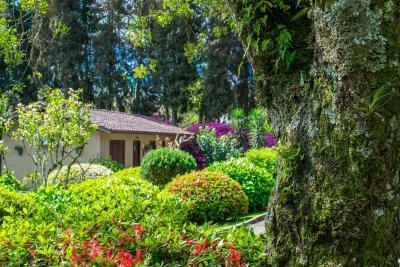 Sítio Quero Quero is located 350 feet from the Road that leads to Gramado and Canela. It is next to Hollywood Dreams Car automobile museum, and supplies free parking on site. When would you like to stay at Hotel Fioreze Quero Quero? 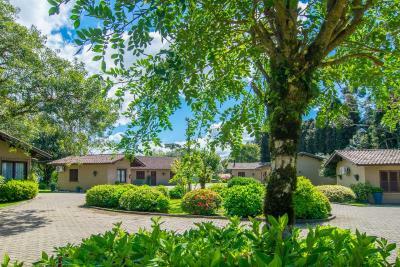 This chalet features a private fireplace and has a TV, minibar, a sitting area with a sofa and a private bathroom with a hairdryer and free toiletries. This room is fully heated and features a TV, minibar and a private bathroom with a hairdryer and free toiletries. This room is fully heated and features a TV, mini-bar and a private bathroom with a hairdryer and free toiletries. Please note that baby cots can be provided. This smaller room room features air conditioning and satellite TV. House Rules Hotel Fioreze Quero Quero takes special requests – add in the next step! Hotel Fioreze Quero Quero accepts these cards and reserves the right to temporarily hold an amount prior to arrival. Please note that baby cots can be provided in some room categories. Please contact the property for further details. Total awesomeness at a good price! It said online the staff spoke English. I didn't find that to be the case, but it didn't bother me. The bed was pretty firm, but again, we only spent one night there and it really wasn't a problem. The sauna could've been hotter. The bathroom is too small.